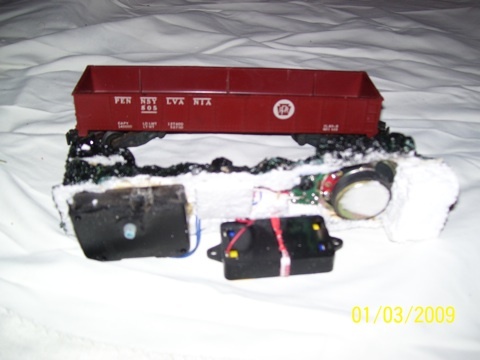 Time to Add Sound to Your Trains! 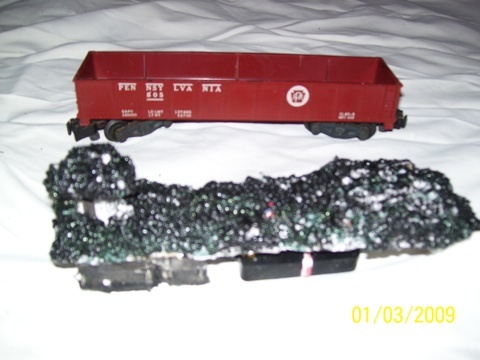 I have an American Flyer, rare, uncatalogued #21004 loco and slant back tender with a rocket freight set including a rare car carrier with a blue semi and all 5 cars, also a rocket launcher car, red caboose and the gondola, which is really the key piece for me, especially for this project! I found this set when I painted apartments for a living; someone left it in a closet minus the track, but with the 100 watt transformer! It even had the original boxes. 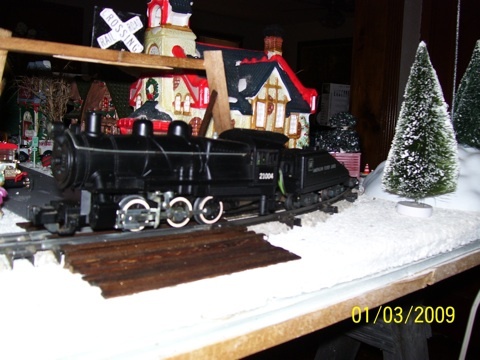 I couldn't believe someone could forget such a beautiful train set. I had one similar to it when I was a child (My dad sold it!) I put it in my closet and it remained there for about 10 years. I didn't think I would be able to find track for it, but eBay has ample supplies of S-gauge stuff! About 2 months ago I purchased some track, built a 4x12 foot layout, cleaned and lubed her up; and she ran perfectly. She even still smokes and chug-chugs loudly! I wanted to add steam whistle sounds to my layout, but the original ones are all stationary (not a good effect for a layout) not to mention pricey, which is a problem since I am on a budget! So one day I had an epiphany! Several months prior to this while "garage sale-ing", I purchased a battery-operated, large, round train clock with sounds for 25 cents. It makes steam, bell, whistle, and chug sounds! This clock had 2 separate batteries - 1 for the clock and 1 for the sound, which was perfect! I took the clock apart, and removed the clock mechanism. This is what produces the hourly sounds as you turn the clock-setting knob; and if you don't have power to the clock, you can turn it to activate it! There are 2 different positions as you turn it. When you hear it click, it turns on sound, goes through all sounds and then stops. Or you can turn it to just where you think it will click and it will remain on until you finish turning it to where it clicks again! I also removed the computer board and speaker (Be careful with the wires - very delicate). It was all too large for my slant back tender, so I thought why not put it in the gondola? Everything fit perfectly with the exception of the speaker, but I found that this could rest on the edges of the gondola! I took a piece of 5/8" white foam and cut it just a little larger than the size of the gondola, traced the shape of the clock mechanism and speaker onto it and carefully cut them out to half the depth of foam. Some of the foam will be a little thin on the sides so be careful with your box knife or whatever you use to cut! Be sure to trace and put the holes for the clock mechanism in the front and the speaker in the back of the foam, so you can lay the computer board in the middle of the bottom of the gondola! Now glue a small wooden dowel (about 1.5" long) to the clock adjustment knob. Epoxy worked well for this. It adhered well to the little ridges on the knob, but be careful not to put too much on or you will glue your knob so that it won't turn! Now you can make a hole to put the wooden dowel through where you cut out the clock mechanism hole. Use something like a small drill bit to make several holes in the foam where the speaker goes, for loud and clear sound! The speaker will be showing a little on each side. Cut 2 small rectangles of foam to glue over sides of speaker! Use Liquid Nails (in the tube), which is friendly to foam, to glue everything. Use a few toothpicks pushed into the foam to help hold everything in place, except the comp board, which you will just lay in the bottom of the gondola. Put a thin piece of foam in the bottom of the gondola for a cushion just under comp board! You will also have to use a Dremel tool to cut off the battery compartment (for the clock) in order to fit it in the gondola. Now you can cut 2 small pieces (essentially rectangles) of foam, the width of gondola and your foam insert. Glue one on the underside over the rear of the insert and one in front (to hold it in the gondola). Also cut a small cube of foam and glue on to the dowel. After all the glue dries, carefully carve off slight small pinches of foam (just a little). Now (very lightly) progressively spray the top of the insert with black spray paint - not too much or it will melt it to nothing. 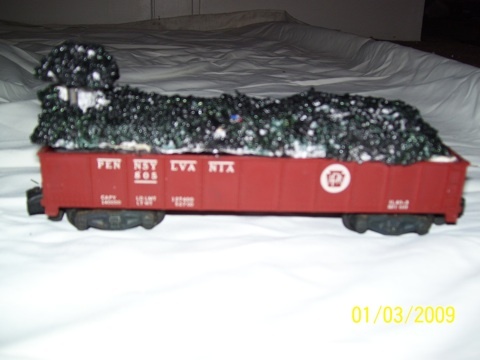 It won't take much to make it look like a coal load! Now paint all with black acrylic paint to look just like coal. Then insert all into the gondola. The ribs in the gondola will cause you to make adjustments, but you will eventually get it in there! Carefully turn the dowel with the foam you glued on, and "Voila!" - train sounds at a budget price! I hope this tip helps people like me on a budget! This whole project took about 1 day to complete - definitely worth the effort! Don't forget to put in the battery!! Look for these train clocks at garage and flea market sales. I'm looking for another for my Life-Like train! Enjoy! A fellow railroader, -John T.
From "Time for Sound" to "Comments"
From "Time for Sound" to "HomePage"